How do you make a 'still'? Thread: How do you make a 'still'? Having the bottle closed tight seems strange to me as a LOT of CO2 will be produced. I bought a 10 liter canister, put in 8 liters of grape juice and a lot of sugar dissolved in a little hot juice. Don't remember how much exactly (it's 25 years ago in Riyadh), but at least 1kg. Add dissolved bakers yeast and let it rest until the bubbling stops. When I tried it I almost poured it in the sink. All of the sugar had been turned into alcohol and the taste was no good. I then added 20% fresh juice, refilled it into bottles and let it rest some more time in the refrigerator. When pouring it out of the canister I tried to avoid stirring any of the yeast accumulated on the bottom to get clear looking wine. The end result was better for my taste than one bottle of austrian wine I received as a gift from someone working at the austrian embassy. It was the time of that Glycol scandal with austrian wine. Some of the bottles had restarted fermentation in the fridge and I ended up with some fine sparking wine. thank you. tried something similar but ended up with vinegar. off to try to find yeast. About the yeast. My mates back then had different theories. Some brought special yeast for wine from home. Some like me used simple bakers yeast available everywhere. The difference is the maximum alcohol content. The yeast is killed eventually by the produced alcohol if there is enough sugar. The wine yeast can tolerate a higher alcohol level than the ordinary bakers yeast. But for me the alcohol content was high enough with the bakers yeast. I'e used a still to extract essential oils. Pretty sure bootlegging liquor is the same process. how can you gauge the alcohol level? i'm told not to sacrifice the taste for higher alcohol levels. have bought some bakers yeast and will report back in a few days. I can't, just go by the taste. The amount of sugar was completely converted by the yeast and the taste horrible as I mentioned before. I got some back in by adding 20% of juice after fermentation. That plus a little storage time in the fridge made for some decent wine. I understand professional wine producers stop the fermentation artificially when the desired mix of alcohol and sugar has been achieved. I could wait as I am not alcohol addicted. Some of the others drank their products just taken from the canister still clouded with yeast. Similar to what is sold in Germany as Federweißer, fresh wine also still clouded, not clear. google throws up some complicated stuff, thought it would be fun to have one in this cursed muslim outpost where a beer at the ritz will set you back 220 bladdy ryals. The distillation scene is 3 minutes into the video. If you listen to the song Copper Kettle it gives some advice. Bob Dylan has a version going on Self Portrait. 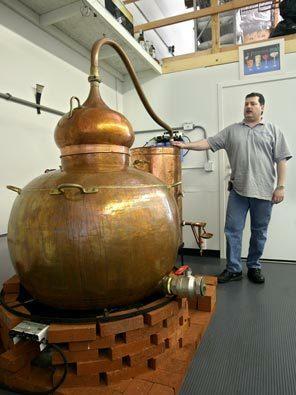 If you are gunna make a "still" then be careful, they can be dangerous... they can explode - Still's are used to distill alcohol into spirits through a process of heat and cooling. You need to know what you are doing with these! try a few shots tequila. Follow as above except place a balloon over the neck secured with a rubber band. When fermentation starts, the balloon will inflate. Your hooch is "finished" when the balloon deflates. Decant being careful to not stir up the dregs. Offset the bad taste of bread yeast by mixing your product with 7-Up or similar. How do you make a 'still'? - Not difficult really. A "still" is basically just a standard pressure cooker. A column (length of tubing) is attached to the lid in place of the plug or relief valve. A take-off line then runs down from the column to a cooler. The cooler is usually water cooled - the easiest option is to use an overlfow chamber in which a coil of tubing is mounted in a pot. The water overflow line from the pot runs back to your sink or drain and the take-off line runs down to your collection vessel (jerry can or similar). The whole thing needs to be temperature controlled. The basic design uses a temperature gauge at the top of the column with your hot plate being adjusted to keep the pot (pressure cooker) simmering. Personally, I would never rely on that - I use a poper temperature controller to automatically control the temperature at the set point and a timer to shut-off the power and water when the run is complete.